A College That Hasn’t Forgotten. When Ebola ravaged West Africa last year, assistance poured in from across the United States. Corporations, elementary schools and even the military pitched in to get money, food and medical care to those afflicted. The College of Saint Rose stood out. 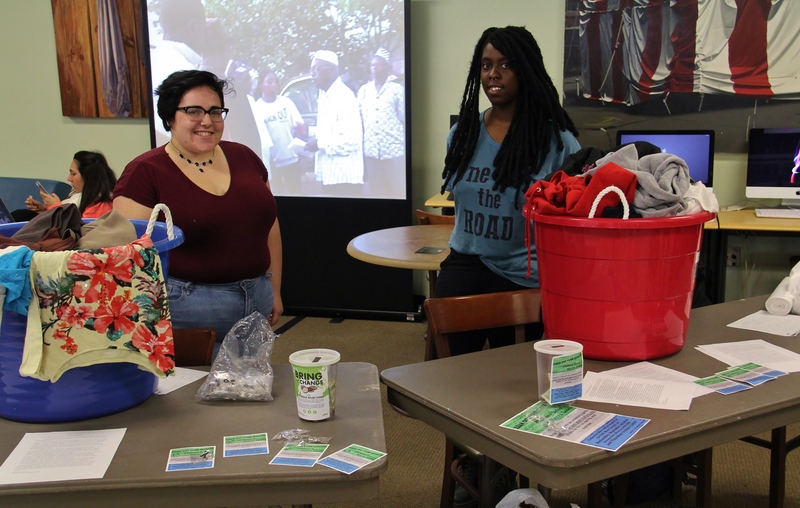 After the College community collected funds, a professor took the money directly to Sierra Leone and saw to it that a trailer-load of rice and other staples was purchased. And, a year later Saint Rose continues to help. The focus now is on the young people in Freetown, Sierra Leone, who lost their parents to the epidemic. “We are a small college, but we are making a really big impact,” said Christina Romeo, a junior, who is president of the English Club. 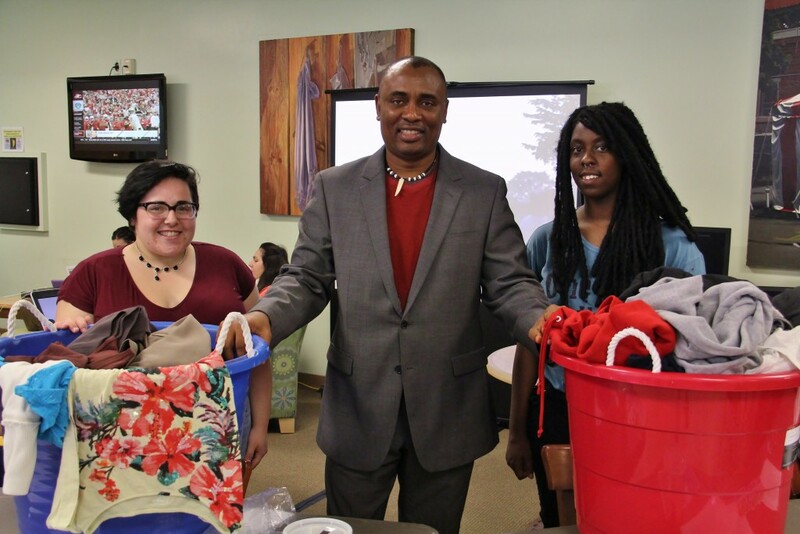 On September 30 and October 1, Romeo and other members, along with the Albany chapter of the Zeta Phi Beta sorority, held a clothing drive in the Main Lounge. 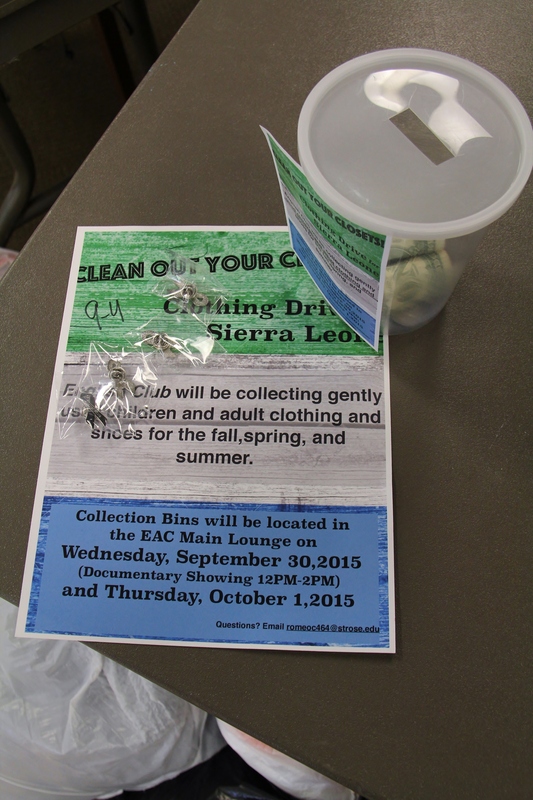 The drive, which followed several months of planning, brought together students and faculty members who are devoted to the idea that Saint Rose maintain its connection to Sierra Leone. Christina Romeo and Shannell Hanna, the president and vice president, respectively, of the Saint Rose English Club, have little doubt that a small institution like Saint Rose can have a large impact. Behind them a video shows the quarantined village in Sierra Leone where food was delivered. The food was purchased with money the Saint Rose community contributed. The story started in December when Marda Mustapha, an associate professor of political science who is from that country, traveled there with the money raised on campus. He made sure that the food purchased with the money went to the quarantined village where his father is chief. A video screened during the clothing drive showed the results: tons of rice, dried fish and cooking oil trucked into the restricted region to the individuals in the village, many of whom wore Reach Out Saint Rose t-shirts. 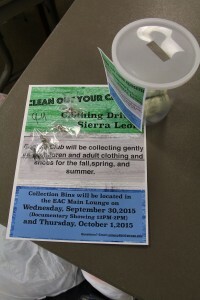 Now, the College is coming together again, to help the teenagers in Sierra Leone left orphaned by the epidemic. The effort, bringing together the College and the West African country, was not a traditional clothing drive. Instead, much of what was collected will be shipped to Sierra Leone and sold as part of a micro-business taking shape to generate money for the young people there. Mustapha and his Saint Rose colleagues have formalized the effort by forming a non-profit organization called Global Relief for African Communities in Emergencies (GRACE.) It is made up of members in Albany and in Sierra Leone, where Mustapha’s sister, Juliana, coordinated the food delivery. At the end of the drive, more than 30 bags of clothing – some brand new – had been collected. And students were gratified by the significant role a small college on the other side of the world could make.